Yes there is something about playing with fire and for me, charcoal barbecue grills are my favorite way bar none of cooking outdoors. The down-side is the preparation time. Lighting a charcoal grill is hardly a spontaneous affair, charcoal takes about 45 minutes from lighting until it is ready to cook on. It's also dirty. If there's any doubt in your mind about whether you want a charcoal grill the use this page that discusses the relative merits of charcoal or gas. Yet some of us just love playing with fires, don't we? 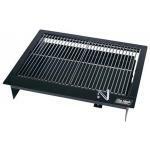 Dependent of the grill that you buy there will be a top grate (for cooking food) and either a lower grate for charcoal or maybe just the base of the barbecue unit. This area is generally referred to as the fire box and the first job is to remove the upper cooking grate so that you have access to place your charcoal in position. Generally speaking those that have a lower charcoal grate are best fueled with charcoal briquettes, they probably also have a base vent and a lid with another vent so you can do indirect cooking or hot smoking. 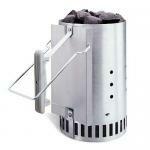 A charcoal chimney starter is a metal cylinder with a charcoal grate mounted inside. Unlit charcoal is placed into the top of the cylinder and newspaper is placed into the bottom, under the grate. When the newspaper is lit, it burns and lights the charcoal above. The "chimney effect" causes the charcoal to light from the bottom all the way up to the top. It will take 10-20 minutes for the coals to light, depending on wind conditions, how much charcoal is in the chimney, and the type of charcoal being used. The charcoal is ready when you see orange colour deep inside the chimney starter, flames licking at the charcoal at the top of the chimney, and grey ash just starting to form on some of the charcoal at the top. At this point you can pour it into the base of your barbecue. 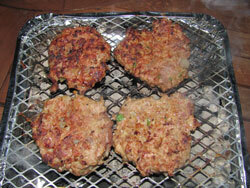 The final option how to light a charcoal grill is to use fire-lighter cubes, gel or lighter fluid. It's certainly a very popular way to light a charcoal fire but it can leave a petrochemical taste in the coals which can taint the food. In order to ensure that you minimize this risk, always make sure that the residue has fully burned off before adding any food onto the cooking grate. When using gel or lighter fluid apply it to the charcoal according to the manufacturers instructions and once lit do not be tempted to add any more once the fire has started. Instant lighting charcoal should also be added into the category above in terms of the petrochemical smell. In addition it burns quicker than regular charcoal. It has it's uses if you are traveling because the charcoal comes in easy to handle packs but that's about the only redeeming feature. Once the charcoal is lit, the coals need chance to settle so a little patience is required. The coals are ready to cook on when the flames have died down and the coals are grey in colour. If meat is placed on the cooking grate before the coals are ready then there will be a high risk of a flare up and a subsequent burnt offering. So now you know how to light a charcoal grill maybe it's time to decide which one to buy. Below I've reviewed some of my favorite charcoal barbecue grills but note that there is a separate section for ceramic kamado grills. If traveling light you need a portable grill so the disposable charcoal barbecue tray may be the answer for a BBQ on the move. They're ideal for tailgating and camping. 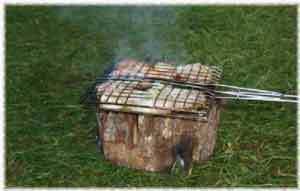 Note: In addition to the tray variety there now is a disposable charcoal barbecue made out of a tree trunk called ECO Grill and we will review this further down the page. Starting with the tray variety it is essentially a foil tray filled with (what used to be) lump wood charcoal and a light grill mesh cover. On top of the charcoal is a fuel impregnated charcoal mat which once lit is all that’s needed to get the grill going. The latest versions of these grills now use briquettes and these appear to provide a more controlled and continuous heat. Good examples of this type of disposable charcoal barbecue grill are the EZ Grill and the environmentally friendly manufactured Lokkii bricks charcoal grill tray marketed by Blue Rhino. Whether you’re a BBQ enthusiast or just an outdoor type this style of cooking may well be for you, it certainly beats lugging around a camping stove and all the paraphernalia to go with it. Having said all of the above, these disposable charcoal barbecue grills cannot replace your backyard grill. If the lighting mat fails………take a firelighter block just in case. It’s low cost so don’t expect quality equipment! Avoid foods that release lots of fat such as sausages and shop bought burgers, go for lean cuts of meat, your own grilled hamburger recipes, fish or vegetables. 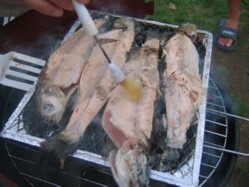 Lightly brush the food with oil before placing it on the grill, this will stop the food from sticking. Despite the error above by some friends of mine, the results were still superb which just goes to prove that you can't beat fresh fish! The EZ Grill has to be one of the best disposable charcoal barbecue grills that I've come across to date. There's some pretty aggressive claims made by the manufacturers about the performance of the EZ Grill so I wanted to road test the grill to see how accurate the claims were. Having removed the packaging I I found a wire support neatly tucked away in the base and this is designed to protect the surface upon which the grill is placed. Inside the grill is an envelope full of charcoal briquettes and on top of the envelope is a fuel impregnated paper sheet. I lit the sheet easily with a safety match and away it went. The flames started to die down after 15 minutes and a little after that I placed some chicken and burgers on the cooking grate. I was a little concerned about how close the food was to the coals but the intensity of the heat proved ideal for the burgers. The chicken needed a little more careful attention and regular turning to ensure that it didn't get too charred but no more attention than I would normally pay when grilling on charcoal. One can easily hold one's hand over the coals and feel the warmth without danger of getting burned and I think that this demonstrates the intensity of the heat. It's not going to heat a branding iron but it's certainly good enough to cook food and yes, it did last for the claimed 90 minutes. These disposable charcoal barbecue grills do have their limitations, they're not a substitute for your backyard grill nor are they designed to be. I've cooked on similar grills before and had flare ups but the EZ Grill appears to have addressed all the limitations extremely well. The heat was constant and controlled with no flare ups so it has to be the best disposable charcoal barbecue grills that I've used. In summary, the claims made by EZ Grill are accurate and I was very happy with it's performance so for a tailgating party or a day at the beach I'd be more than happy to use one again. Note: With one of the EZ Grills that I sampled, the fuel impregnated paper had moved to one side and didn't sit on the charcoal envelope and this made lighting slightly more difficult. If I experienced this again I would take a little time to site the paper in it's correct position before attempting to light it. So the disposable charcoal grill tray is becoming a more honed solution now flareups and short grilling times are a thing of the past but I still have one little niggle and that's the amount of packaging and metallic waste. Well I've now found the ECO Grill that answers all my issues with the instant foil tray barbecue and even goes a step further because the flavor of the food that comes off one of these babies is fantastic too! So great tasting food is guaranteed and that's also backed up by the fact that each grill comes with a resin wick that makes it easy to light without any need for lighter fuel or any petroleum based product that inevitably will taint the flavor of your food. These grills are fully portable so you can set up your cookout anywhere, you can even make home life easy by just popping one of these in the bottom of your kettle barbecue and you'll get heat in minutes and that great Alder aroma in one easy strike of a match. Is there a down side to this instant barbecue grill? Well just one. If you're on the move, you need to have a barbecue basket or a pan in which to put your food. If you do want to grill burgers and sausages individually then I use a Teflon grill mat. It's a minor point and compared with the lack of trash and the great tasting food, I think that the positives far outweigh this issue and I for one will be taking one of these disposable charcoal barbecue grills with me on my next picnic. 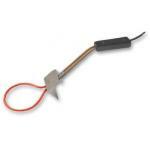 The Fire Magic charcoal barbecue grills range isn’t extensive and indeed Fire Magic are more renowned for gas. 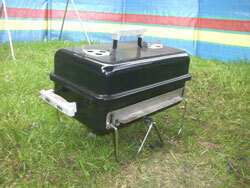 For the traditional BBQ smoker enthusiast however there is a small range of charcoal fired units. Despite the range being relatively small, the good news is that it is diverse, providing options for free standing and built in units all made to the highest quality standards that you expect from Fire Magic. The stainless steel unit is available either as a built in unit or portable and comes in two sizes. It includes a heavy duty stainless steel hood with a built in analogue thermometer and an adjustable fire pan for controlled cooking. The Firemaster is best described as counter top style, again with an adjustable charcoal pan but this one is constructed from powder coated steel. 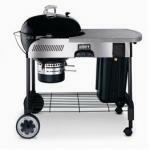 Between the two ranges of charcoal barbecues there are grilling areas between 368 and 540 sq inches. The Lift A Fire is essentially the portable grill available in two sizes and features a front loading access for the charcoal. 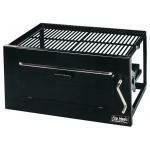 Just like the Firemaster, it has an adjustable fire pan and is constructed of powder coated steel. Fire Magic support their barbecue grills with a full range of accessories including a great rotisserie kit perfect for spit roasting chicken. Is the PK Grill the ultimate in portable cooking? Here you'll find an extensive PK Grill review together with a summary of my interview with the manufacturer to help you decide. Maybe to call it a grill is a misnomer because what attracted me to take a closer look was the fact that you can also use it for indirect cooking too. Use it with the lid on and you can try your hand a bit of smoking. Looking at the compact way that it packs together for transport suggests that this could be the ultimate when it comes to camping and tailgating. It’s claimed that the cast structure ensures good heat reflection so this should mean being able to get up to reasonable temperatures and cook evenly – something that I found difficult to do when I recently cooked on a Weber “Go Anywhere”. How good the heat retention is remains to be seen as this will also have an effect on charcoal consumption, having said that there is a hinged grid to allow for easy re-fuelling without disturbing your food. In order to use an enclosed cooking process it’s vital to have vents top and bottom and the PK grill has 2 so this should make it easy to control. I haven’t yet had chance to cook on one of these grills but if it lives up to expectations then we could all be in for a treat. And, it's completely made in the good ole' USA! Why Buy A PK Grill? If you’re into camping or tailgating then you need to consider the PK Grill. It’s easy to carry, weighs just 40 pounds (18Kg) and flexible in its cooking capabilities. Its got a rectangular grill space of just over 300 sq inches so more than adequate to feed a family. Of course you can just have it at home and leave it in your back yard – it won’t rust. "The heavy cast aluminum construction reflects heat from all surfaces causing food to cook more evenly without constant turning or re-positioning on the grill. Adjustable vents in the lid and dampers under the fire allow easy temperature control for direct grilling or slow cooking without flare-ups from dripping fat. Includes complete instructions, including recipes. Adjustable vents in the lid and dampers under the fire allow easy temperature control for slow cooking without flare-ups from dripping fat. 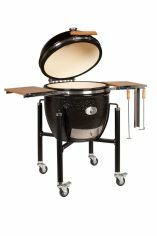 Once the lid is lowered, the food cooks evenly - bathed in smoke for an unforgettable charcoal-fed hickory smoked flavor. Because of its aluminum construction, the Portable Kitchen® cooker should last for years without rusting. Functions as a grill and independent cooking roaster without flare-ups! Four adjustable vents and dampers (two top and two bottom) control temperature. All aluminum construction will not rust. Oven detaches from carriage for easy cleaning, camping and tailgating. Hinged grid allows easy refueling, without removing food. Made completely in the USA! Side and bottom trays hold food and utensils. The heavy cast aluminum construction of the Portable Kitchen® cooker reflects heat from all surfaces far better than charcoal barbecue grills made from other materials. This reflected heat cooks food more evenly without constant turning or re-positioning on the grill." If space is at a premium then the Weber Go Anywhere barbecue grill could be the thing for you. It’s certainly light weight, compact and with foldaway legs, it makes for a neat unit to easily stow. At 13 pounds (6 kg) it’s not difficult to carry. As you’d expect from Weber, it’s black! The rectangular cooking grid provides 160 sq inches of cooking space which is enough for a couple of people but grilling for any more than three would require patience and to eat in shifts. There are vents top and bottom to control the burn rate of the charcoal so you do have control over your cooking. Because the grill is so close to the coals, set up is all important and I found this to be tricky. It’s easy to have the coals going so fast and everything cooks to a crisp but that’s not the way I like it. With the lid on you can get reasonable results but you must keep an eye on the coals, it’s easy to loose temperature and then difficult to get it back. I did however have some great success cooking slices of eggplant indirectly. Coals at one side, eggplant at the other, drizzled with olive oil, lid on and off to the bar. Two hours and a few beers later they were absolutely fantastic. Why Buy A “Go Anywhere”? These charcoal barbecue grills not expensive to buy, I’ve cooked on better but not something that was so portable. You buy one of these if you truly want to go anywhere and cook. If it’s portability for tailgating (and you’ve got a bit more money to spend) then you might find that a Bubba Keg or PK Grill is more to your liking. These charcoal barbecue grills are for you if you like to grill and also get into that smoky flavor without the hassle or expense of a big smoker grill unit. Having said that, these barbecues come with a few neat ideas that really make life easy. First of all there’s an on board gas tank to assist in the lighting of the coals so you can throw away the lighter fluid and all the frustrations that can go with it. There’s also a charcoal bin to keep everything nice and compact all built into a cart with a work surface. These large kettle barbecues will provide ample cooking area (22.5 inches) so plenty of room if you want to set one up for indirect cooking too. The Ranch Kettle is the Weber answer for those constantly catering for large groups. 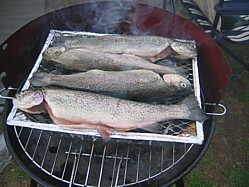 Are you fed up with having to cook for hours on end on a small grill? Complaints from people who have had to wait ages for their food? Well all that is a thing of the past for Weber charcoal barbecue grills have come up with ‘The Ranch’ (which has been described as the Weber kettle on steroids). These charcoal barbecue grills were originally designed for caterers and country club chefs but they are perfect for anyone who regularly caters to large crowds. The enormous cooking area means that you can cook numerous items at a time. The downside is of course that you need lots and lots of charcoal! Weber says you can put 27 game hens on one at once and that is a fact! What I like about these massive grills is that they are so flexible. For example you can put your charcoal to one side with one item on the grate directly over the flame and then you can rotate it on to the next piece – great if you need to pace your food delivery. 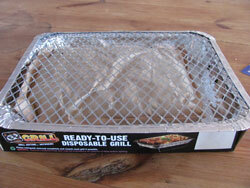 You can also build charcoal mounds to either side, place the food in the middle of the grate and smoke indirectly. But best of all you can cook ALL the food in one go and be sitting down with your friends, family or colleagues and eat with them. So when it comes down to it ‘The Ranch’ from the Weber is, quite simply, the bees knees. 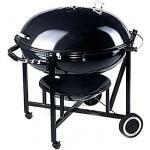 These charcoal barbecue grills are ideal for the largest of gatherings and parties. Patented tuck-away lid that slides conveniently into its holder.